What is a garbage disposal? Garbage disposal units are generally placed under a kitchen sink, in between the drain and the pipe. They are electrically powered and shred food and other wastes into tiny pieces so that they do not cause blockage in the plumbing. They are available in a number of design and price ranges. Our journey for this review is to provide a comprehensive review of all of today’s best garbage disposal models. How does a garbage disposal work? A sink waste disposal unit contains a chamber for collecting food waste. Rotating blades then cut these into tiny little pieces. The chambers are usually enclosed with rubber casings to prevent the food from flying up and to insulate the noise. Once the food has been pulverized, it can pass safely through the pipe leaving the sink. Sink waste disposers not only make waste disposal easier but also reduce environmental damage. Given that sink wastes account for 20% of the total household waste, installing a kitchen sink waste disposal unit is convenient, good for the environment, and a good investment. Well, let’s get to it. There is a lot of information covered in this review for many of the top models available. If you want the bottom line, check out the top models in the following table where the Editor’s Picks are highlighted for different user scenarios. 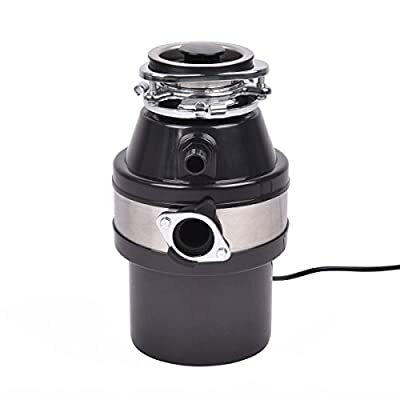 Motor Power & Performance of this Compact Garbage Disposal: The higher the Horsepower of your garbage disposal, the faster, smoother, and more efficient it will work. High-end models usually carry an HP of ¾ HP to 1 HP. Thus, making chopping through wasted food like carrots, artichokes, and bones faster and more efficient. See the image to the right that illustrates the MultiGrind Technology of the InSinkErator Evolution Compact. It delivers more than enough power to grind food waste into the smallest pieces possible which can be easily flushed down the system without causing blockage in the machine or drain pipes. Feed Type: There are essentially two types of waste disposers – continuous feed and batch feed. In a continuous feed disposer, the machine works continuously while the power is on. In a batch feed machine, waste materials are placed in batches during the operation. Materials & Components: Since people use their sinks typically every day cooking and cleaning dishes, it’s important to have a high-quality, low maintenance disposer made from stainless steel components to extend the life and usage of the product. 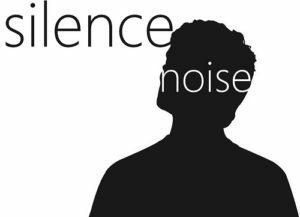 Noise: Noise is another factor to consider. Ideally, the garbage disposal is not so loud to prevent communication or to disturb others if you are in a tight living space. The image on the right illustrates InSinkErator’s SoundSeal technology that utilizes different components to keep sound levels at its lowest. These components include Sound Limiter, Anti-Vibration Mount, Quiet Collar Sink Baffle and Anti-Vibration Tailpipe. Other manufacturers apply their own approaches to limit noise. Installation: A clear decision point will be whether or not you will install your new unit yourself or have a professional do it. If you are installing yourself, there are a few important factors to consider. Electrical: Does the unit have a plug and is there easy access to an electrical connection? If there is not a simple plug, someone with electrical expertise will be required. Space: Tight spaces will make the installation more challenging. Brand: If replacing an existing unit, there may be different fit and fixture considerations for different brands and models. Dimensions & Capacity: Simply the unit must fit in the space you have available. Additionally, you may want to consider a smaller unit if you want to allow more space for under counter storage. If space is constrained, you will need to consider the tradeoff between power and space. Septic: If you have a septic system, you additional should make sure the unit is suitable for your setup. This kitchen sink waste disposal unit comes with a 1 horsepower, 2800 RPM motor. It has stainless steel grinding compartments and corrosion resistant chambers. It runs on 115 volts, 60 hertz, and 7 amperes. The disposer has enough power to grind almost any type of waste materials. The high speed, powerful motors ensure that the machine does not get jammed. The motors can also be rotated in an anticlockwise direction if they get stuck. Overall, the machine runs very smoothly, produces minimum noise and is very easy to clean. The glass filled nylon used in the grinding chamber effectively insulates the noise and also require little water while cleaning. The garbage disposal unit is very easy to install and uninstall and come with a 36-inch long power cord, which makes it easier to station them almost anywhere. If the machine starts malfunctioning with the warranty period, you will be provided with a replacement. This machine provides effective grinding and shredding. The grinding chambers have a capacity of 26 oz and are made of corrosion resistant material. The motors and the grinding system are made of galvanized steel and do not wear away easily. They are best used with cold water. Although the disposer uses tough machinery and a sturdy built, the outer body can wear away with time. Apart from that, the machine offers excellent performance with its ¾ horsepower dura-drive induction motor and come with a 3-year warranty. The brand also has service centers in various areas and free call services. All you have to do is make one call, and a trained professional will be dispatched right to your doorstep. The waste King L-1001 is compatible with dishwashers and sinks. It comes with a fast and easy mount and can be placed almost anywhere. The waste from this disposer is environment-friendly and can be used for compost and landfills. It has a high speed 2600 RPM motor, which quickly shreds down the waste. The machine also provides very smooth grinding with no noise. It has other efficient features like galvanized steel grind ring, seal stoppers, sleeve type bearings and overload protector. The machine runs on batteries and therefore can be used almost anywhere. This is a top of the line disposers from Insinkerator with a very smooth and noiseless grinding operation. It is one of the best food grinders and has a huge sell ratio across the world. It can be installed under sinks and also used for septic tanks and household garbage disposals. It offers the highest standard when it comes to clean garbage disposal. The machine is eco-friendly and energy efficient. It is made using quality materials and offers resistance to corrosion and jamming. The high torque blades are effective for shredding and grinding almost any waste materials. The Evolution Compact uses advanced technologies to minimize the sound. You can hold easily hold conversations when the machine is still in operation. The disposer also features superior insulation, motor, anti-vibration sink pipe, and anti-vibration tailpipe. Moen GX50C may be the perfect kitchen sink waste disposer for all your garbage disposal issues. This machine offers great efficiency in grinding all sorts of domestic wastes. You can always have them fitted under your sink to keep the drains from getting clogged. Apart from that, the disposer can also be used for shredding other forms of wastes which can later be used for landfills and composts. This neat unit comes with a high powered motor that can offer grinding action of up to 2,600 RPM. The resulting torque is sufficient enough to grind down all types of sink wastes in a very short span of time. The unit is also very easy to install and fits well into small areas. An extension power cord can be used in case of inconveniences. This disposer uses three bolt mounting assemblies, twist and lock installation and permanent magnet motor. This ensures the user-friendliness of the machine. It also requires very little maintenance once installed and above all, cleaning is not at all an issue. There are water pipes fitted into the main compartment for direct water flow and a completely hassle-free rinse off. The grinding compartments are made of noncorrosive material and do not wear away easily. They have a compact and streamlined design to maximize the effects of the blade cutters. The grinding compartments also have very tightly fitted rubber sealing to keep waste matters from flying back to the sink. This also makes sure that there is no leakage while the machine is at work. Hence, no watery mess under your kitchen sinks. All of these features make Moen the perfect choice for clean kitchen spaces and efficient waste disposal. The ½ horsepower grinding allows efficient grinding of all category wastes. This makes sure that the blades don’t get stuck mid-performance. If in case they do, the machine allows for counter rotation for freeing the blades. This kitchen waste disposer comes with a pre-installed power cord. Hence, you will not have to deal with extra buys and fittings. This little feature saves up a lot of money and labor. The vortex permanent magnet motor offers speeds of up to 2,600 RPM. The machine can catch up the maximum speed in just a matter of few seconds. This gives an exceptional grinding action of the machine making sure that there is not juice jamming. The machine comes in a very compact design. When placed under sinks, you will still have enough room to fit in wipers and brooms. The machine is very lightweight and does not pull down your basin. Installation is a very quick and easy process. Moen generally uses the universally used 3-bolt mounting assemblies. All you have to do is fix the disposer in the right place and tighten the screws. The machine is then good to go. 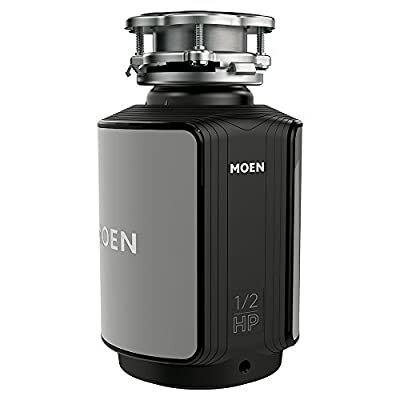 The best thing about the Moen kitchen sink waste disposer is its great sound shield technology. The body is insulated with heat-absorbent materials and reduces noise by a great degree. You can easily hold conversations while the machine is on and the person in adjacent rooms may not even know if the machine is on. The machine is continuous feed. That is as long as it is connected to power, it will continuously break down wastes passed down from the sink. There will be no need of opening the grinding compartments manually and feeding waste matter. The power cord included in the machine is a great benefit. You don’t have to remember and reach out for one when needed. A sleek body that looks very appealing. The machine also comes with great finishing on the outer body. The sound is reduced to a dull humming. The blades do not get easily jammed. The grinding compartments are made of stainless steel and are corrosion resistant as well as easy to rinse off. The outer body may start rusting out if not maintained properly. The machine is leak free and noise proof. This addresses two of the most common problems with waste disposers. The blades are also strong enough with powerful, swift grinding and no jamming. Considering these things, the Moen GX50C kitchen sink waste disposer may be considered a good bargain. Sometimes I think about how different my kitchen would be without this relatively compact garbage disposal. Most homeowners I know take their garbage disposal for granted especially how useful and beneficial a garbage disposal is. InSinkErator has created useful products and various garbage disposals making these products useful for any type of kitchen or restaurant. 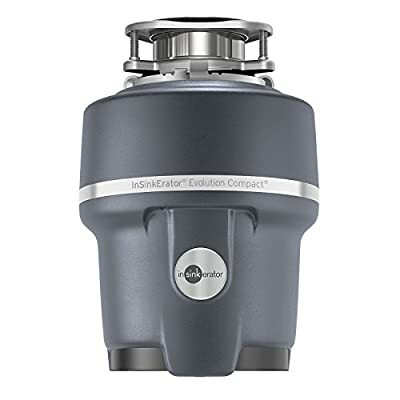 If you thinking of replacing your current garbage disposal due to some defect or it’s not silent enough, or you want a new garbage disposal to compliment your modern kitchen, then you should check out the InSinkErator Evolution Septic Assistant ¾ HP unit. So, let’s have a closer look at why so many customers find this disposal worthwhile. What’s Included: When you purchase the InSinkErator Evolution Compact Garbage Disposal, you will get the disposer unit, Quick Lock Sink Mount, Jam-Buster Wrench, Quiet Collar Sink Baffle, Anti-Vibration Mount, Anti-Vibration Tailpipe Mount, Stainless Steel Sink Stopper, Spring Type Hose Clamp, and the installation instructions. Optional Accessories: InSinkErator also has numerous accessories available to complement this Compact Garbage Disposal unit. These accessories include: Custom Color Sink Stoppers, Flexible Discharge Tubes, Power Cord Kit, Sink Flanges, Jam Buster Wrench, Dishwasher Connector Kits and even a Sink Top Switch. These accessories can be purchased separately if desired. Insinkerator has been a trusted name in food waste disposers for almost 75 years now. The brand has given efficient, basic and reliable products till date. 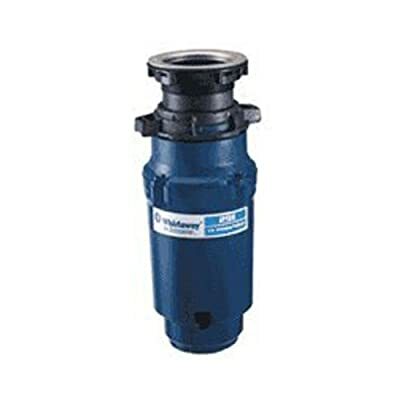 Their Evolution series has a number of disposers in various shapes and sizes. Manufactured by an American company, Insinkerator disposers are one of the best-selling and receive huge marketability throughout the world. 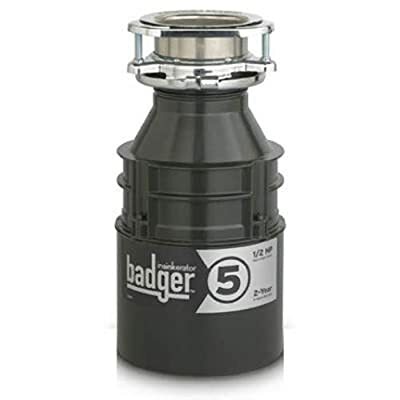 Their Badger 5 disposer is very functional, reliable and affordable as well. These machines come with galvanized steel body and very powerful motors. When it comes to shredding, these can tackle almost any form of waste matter. 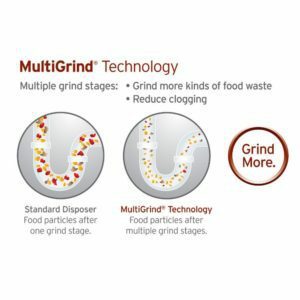 The machine uses an onstage grinder, which grinds all types of food wastes and turns it into a liquefied form before passing it on to the sewer. The machine is also very easy to install and operate. It comes with a 2year in-home limited warranty which includes free service calls. The brand has a network of 1500 professional dispatched at various service centers to install, replace or repair the disposers. Medium size, hence can be placed almost anywhere. 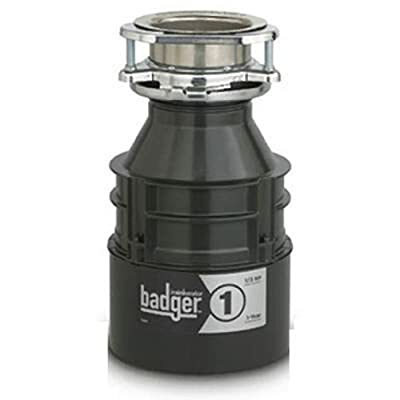 Insinkerator Badger 1 is the choice for the professionals and very easy to install and operate. The disposer gives super-efficient grinding and high durability. The body and the compartment chambers are made of corrosion resistant materials and do not wear away with time. This also ensures that the tubing does not start leaking with time. The openings of the chamber are fitted with rubber, which makes sure that the particles do not fly out of the chamber when the machine is being operated. When you buy this product, you also get a quick lock stick mount, jam buster wrench, stopper, tailpipe gasket and an instruction manual. The product comes with a 2-year warranty and offers immediate replacements if any malfunctioning is reported within the warranty period. Their brand also offers services like free calls and service centers, which can be contacted for professional help. Insinkerator Evolution Excel uses very advanced mechanisms. The disposer has a 40 oz. Stainless steel grinding chamber. This ensures that you can shred a large amount of waste in a single sitting. The chambers are properly sealed so you will not have particles flying out during the grinding process. The chambers are corrosion resistant and very durable. You can use it for any type of food wastes. One very interesting thing about the Evolution Excel is that it uses a triple grinding technology, and uses 1 horsepower dura drive induction motor, wherein the waste materials are broken down into three different stages, this makes sure that the process is very fast and gives easily disposable waste. The waste matter is mixed with water for easy disposal. The machine features sound seal technology, hence delivering very quiet grinding without creating a disturbance in the adjacent rooms. The providers offer a 7-year warranty for this product and also dispatch trained servicemen for replacement, installation, and repair. This is one of the most reliable kitchen sink waste disposal units on the market and comes with the longest warranty. The machine mostly uses imported machine parts and offer smooth performance. It has 0.3 horsepower motors with 1900 RPM which gives high torque rotations. The high-speed motors ensure that nay waste food is quickly shredded down. The grinding chamber is tightly sealed, so you will also not have to deal with leaking wastes. The body is made of corrosion resistant materials and give a lasting good. One of the advantages of using Waste King is that it is very quiet. This is because the disposer is insulated with sound absorbing materials. As for the durability, the stainless steel body ensures that the machine gives a lasting good. Also, the body does not get easily rusted. A 36-inch power cord is also included with the disposer. This disposal uses 0.5 horsepower motor with 2600 RPM. The motor offers high torque, which can efficiently churn down the waste in a very short time. The blades are made of stainless steel and do not get rusted over long periods of time. Hence, you will not have to deal with a frequent replacement. The grinding chamber is tightly sealed and prevents the waste matter from flying back. The body is insulated with sound insulating material and runs very noiselessly. Overall, the machine is very durable, corrosion resistant and comes with a 5-year warranty. The package also consists if a free 36-inch power cord. This machine has all the features that are expected of a good sink waste disposer. It has a heavy duty 1/2 horsepower permanent magnet motor, 2800 RPM is grinding action and large capacity galvanized steel turntables. The grinding chamber is made of the superior quality stainless steel. They do not rust easily and are also easy to clean. The machine produces minimum noise and hence does not cause any disturbance when in operation. The machine requires a direct power connection. This environment-friendly disposer is a great pick on a reasonable budget. This Continuous Feed Garbage Disposer is a great choice for those who love spending time in the kitchen. This garbage disposer enjoys extensive marketability throughout the world. 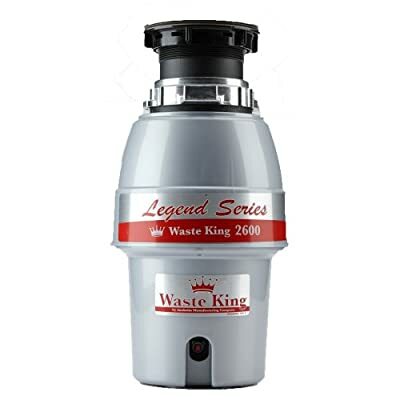 Waste King latest series, known as the Legend Series has some of the best garbage disposers suited for various purposes. This time, the brand had addressed all the major concerns and demands surrounding garbage disposers. The 1/3 HP continuous feed garbage disposer can be fitted under sinks, dishwashers as well as properly sized septic tanks. It has a large grinding compartment and can take in a huge amount of waste matter at a time. The large size makes this more suitable for large-scale uses, probably in a busy kitchen and restaurants. The rotary blades fitted inside the grinding chamber cut down the waste matter into tiny pieces of about 1 mm. This prevents the drain pipe from clogging, thus averting a lot of trouble. It is also a very environment-friendly method of garbage disposal. If you want to make more out of your machine, you may collect biodegradable waste separately and use the ground waste for landfills and composts. The powerful motor and strong blades are sufficient to cut down all types of waste matter. You don’t have to worry about stalks and bones jamming your machine anymore. The grinding compartments are made of stainless steel. Hence, they are corrosion and rust resistant. It stays in shape for a long time. The use of stainless steel also makes the cleaning a lot easier. The waste particles do not stick to the sides. Upon flushing with slightly warm water, the entire dirt and grime get washed away easily. The outer body is made of galvanized steel and is also rust and corrosion resistant. It also has a very sleek and streamlined design looks very neat. The fittings also use corrosion-resistant bolts and plastic casings. This helps in preventing leakages and also keeps the waste particles from flying out of the grinding compartments. There is every reason for trying out the Waste King Legend Series ¾ HP, but the best reason is the customer service provided by the brand. They have a number of outposts located in several cities and also run a number of helplines with toll-free calls. You can ask for help during the time of installation as well as for repairs and replacements. Dial them up, and a skilled service worker will be dispatched to your house. The services will be completely free within the warranty period. Once the warranty period gets over, you will be required to make pay-per-visits. The machine uses a vortex permanent magnet motor for maximum power per pound. The motors offer a speed of 2700 RPM. The machine reaches its highest speed after just seconds of connecting to power. The powerful grinders used inside the grinding compartments can easily tackle even the toughest of the stalks. You will not have to deal with any jamming during mid-performance. The grinding chambers are lined with glass filled polyester for maximum protection. The machine is armed with an overload protector. Hence, it automatically disconnects itself in the case of overload, thus averting damage. This continuous feed garbage disposer uses stainless steel swivel impellers. The machine is continuous feed. Hence, you can leave it all to itself after the installation. The machine comes with a 36-inch long power cord. You can reset the machine if you are continually using it for several batches. The machine is very easy to assemble. You can do it even without professional help. However, if you are not willing to take chances, you can always call in the professionals. The machine comes with an 8-year in-home warranty. This is the longest warranty period ever offered for any waste disposer. There has been no record of leakage associated with this disposer. Uses effective noise reduction technology. The disposer has a very sturdy and durable built and will stay in perfect shape, way past the warranty period. Very slow drainage. This might result in the flooding of the sink if you are not careful enough. Produces a loud click every time you turn it on. 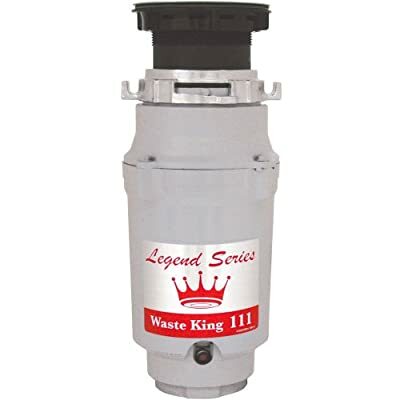 The Waste King Legend Series ¾ HP continuous feed garbage disposer is a very powerful and durable disposer. Investing in it is almost like investing for a lifetime. 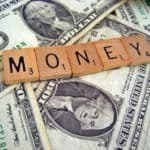 Over time, you will be saving a lot of money and unnecessary hassle. Given that the machine has only received positive reviews so far, you can confidently give it a try. 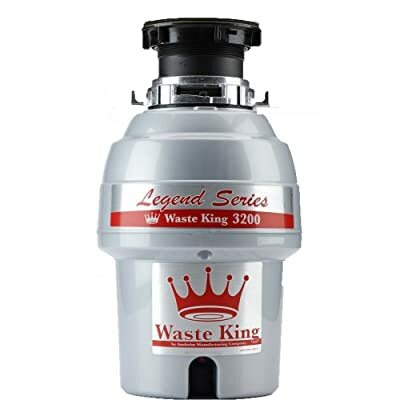 The Waste King Legend Series 9930 Garbage Disposal with High Outlet has a 1/2 Horsepower with a high speed of 2600 RPM permanent magnet motor. The Legend 9930 also contains Stainless Steel Impellers to reduce jamming, and it’s even has a removable splash guard to make the garbage disposal easy to clean. 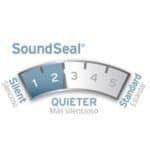 Insulated stainless steel components reduce noise: The fast and easy mount system include all the necessary hardware for a hassle-free installation. The rust-free grinding components come with a 5 Year In-Home warranty against defects. Experience a More Powerful Grind: This corrosion free garbage disposal also features a high speed 2600 RPM Vortex permanent magnet motor, which offers more power per pound than comparative disposers. This 1/2 horsepower motor will grind just about anything which requires 115 volts, 60 Hertz, and 7.0 current amp to operate. Jam-Free, Mess-Free Feeds: The Legend 9930 is a continuous-feed disposal unit which means you can add waste while the unit operates. The Stainless Steel Swivel impellers reduce jamming, and the easily removable splash guard makes it easy to clean. Grinding Components Minimize Noise and Wear: Because the Legend 9930‘s grinding chamber is made of stainless steel, you will never have to worry about corrosion. Also, the stainless steel grinding components are insulated, so you’ll get the quietest grind possible. 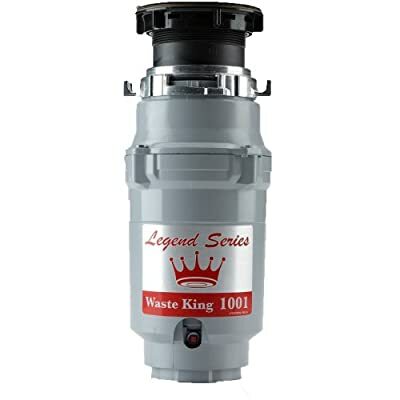 A Garbage Disposal with High Outlet That Works with Septic Tanks: The Waste King Legend 9930 includes a fast and easy mount system, with all the necessary hardware for no-hassle installation. 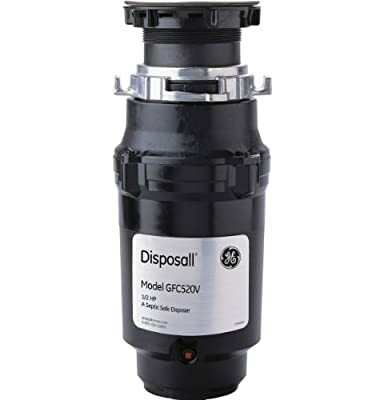 This garbage disposal with a high outlet is safe for properly sized septic tanks and comes with a 36-inch power cord. 5 Year In-Home Service Warranty: The Waste King Legend 9930 is backed by a limited mechanical warranty. This means that if your disposal develops a material or mechanical defect within the lifetime of the original purchaser, it will be replaced in your home – free of charge. The Waste King Legend 9930 1/2 Horsepower showcase an ultra powerful motor. Won’t recommend grinding bones and other hardened stuff. Once installed this Continuous Feed Garbage Disposal with High Outlet it will more than earn its place in your kitchen. 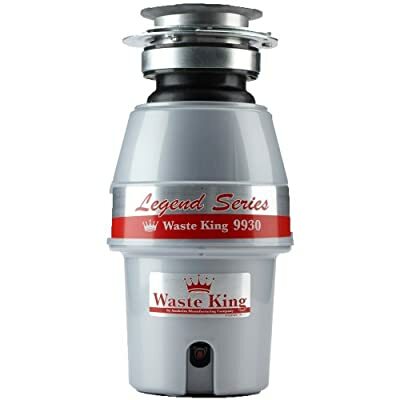 Comparing the Waste King Legend 9930 against other garbage disposal units, the 9930 is a great choice for any household or small business that doesn’t like having excessive food waste around the kitchen. Waste Maid Food Disposers is one of the leading brands in the production of food waste disposers. Their lines of products offer quality, reliability, affordability, and craftsmanship to the public. These product lines include: Waste Maid, Waste Maid Elite, Waste Maid Pro, Waste Maid Elite, Titan, Eco Logic and Bone Crusher. One of their best and most affordable food waste unit is the Waste Maid 158 Standard ½ Horsepower Food Waste Disposer. This cheap garbage disposal has all the features of most high-end garbage disposal units, but the only difference is you will spend so much less. 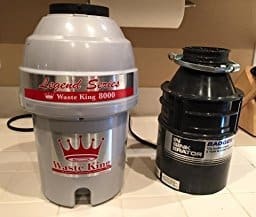 Speed Master Mounting System: Waste Maid designed all their disposers with a speed master mounting system to make it easy for any novice to install their newly purchased disposer. The mounting system minimizes installation time which requires no bolts to perform this task, ultimately saving you expensive costs on hiring professional plumbers. Bio Shield: With the bio-shield feature you can rest assured that the bacteria caused by foul odor will be eliminated helping you keep your family safe from harmful infections. This safety feature is built into the wet components of the disposer to help prevent odor build up in the food waste chamber. Torque Master: Waste Maid Food Waste Disposers has the latest technology built into their disposers, and one of these advanced applications is the Torque Master. The Torque Master Grinding System can handle everyday food waste like chicken bones, vegetable leftovers and fruit scraps. This grinding system is made up of computer designed and balanced components working together as one. Thus providing a superior grind combined with a long system lifespan. Silver Guard: Even though the standard model doesn’t come with a silver guard it’s worth mentioning. The Silver Guard is only available with the Deluxe and Premium models of Waste Maid. The magnetic Silver Guard captures most metal objects before they can enter the disposing chamber. This protective feature prevents damage to valuable items such as expensive cutlery as well as unnecessary repairs to the disposal. 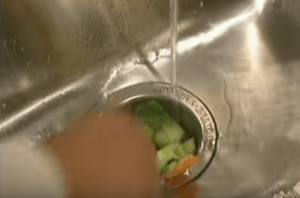 Removable Splash Guard: The removable splash guard may seem like an insignificant feature, but it helps to keep the kitchen sink clean, and it also is seen as a safety feature while disposing of food waste. The Waste Maid 158 Standard is a cheap garbage disposal unit but has all the important features you want in a reliable food waste disposer. It is lightweight, affordable with excellent safety features and easy to install. 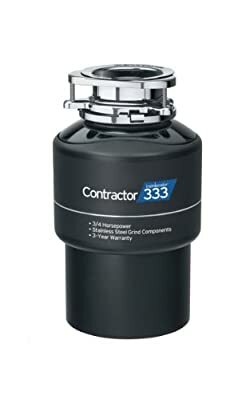 While the Whirlaway 291 Garbage Disposal is not the most powerful waste disposal unit on the market, it surely brings some drastic performances out of this tiny unit. The idea behind this small food waste disposer is to help people who don’t need powerful horsepower to grind up toughest food waste. But what it does offer is a compact, space-saving design at a remarkably cost-effective price point. The motor boast of a powerful ½ HP, so it will handle the waste of a small to medium size household. Durability and longevity are two main characteristics that I am sure of every homeowner to want in their kitchen appliances; however, when you decide to invest in a lesser known brand, you must be prepared for the unexpected, but when it comes to household names you’ll be sure of receiving top-notch products and services for your hard earned money. 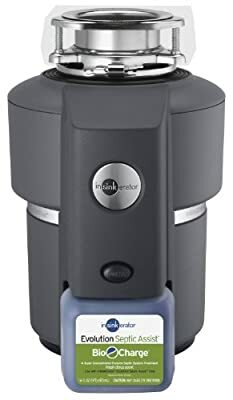 So if you’re looking for a quality food waste disposer that will be able to handle a good amount of waste the Whirlaway 291 Garbage Disposer has made hundreds of homeowners happy. I’ll be honest: Choosing the Whirlaway 291 ½ Horsepower Unit because of two reasons: price and compact design but it doesn’t mean that it doesn’t excel in the grinding compartment because it surely does. The Whirlaway 291 comes with corrosion-resistant grinding components, a removable splash guard, and a simple and quick mounting system for easy installation. Best of all, due to its streamlined and compact design, it is made to fit tight spaces underneath the kitchen sink. Installation is quick and easy. And like the name indicates E-Z Mounting System does make the installation process easy. When we take a look at the permanent magnet, the high-speed motor which produces more power per pound, the ½ HP motor is more than capable of grinding soft food debris, but you shouldn’t expect to be using it to grind hard food waste like bones or corn. Another important feature that you’ll hear is about the blades: the blades inside the chamber do not spin but instead slide ultimately producing a quieter grind than most waste disposal units. The slide effect is also beneficial in effectively reducing jamming within the grinding chamber. Unfortunately, there’s no cord provided with the purchase of the Whirlaway 291 ½ Horsepower Garbage Disposal, but you’ll be pleased t know that any garbage disposal power cord will work just fine with this unit. Lightweight, Compact Design – The Whirlaway 291 weighs an astonishing 8 pounds with a dimension product of 6.1 x 13.7 x 5.9 inches. Powerful Motor – With a ½ HP, this permanent magnet motor produces more power per pound. Corrosion Resistant – For longevity and durability the Whirlaway chamber is made from corrosion-free materials. Easy Installation – The patented PLUMB E-Z Mount System makes the installation for novices’ quick and easy. Whirlpool has been in home improvement business for more than a century and secured their spot as one of the trusted names in thousands of homes. Even after one hundred years, they continue to produce quality products which you and I can be proud of. All of their garbage disposals units are produced in the USA and are compatible with septic tanks. One particular brand that stands tall with features such as efficient grinding capabilities, quiet mode operation, power and durability are the highly recommended Whirlpool GC2000XE Continuous Feed Garbage Disposal. Both the grinding compartment and grinding components have been carefully insulated to minimize the amount of noise it makes while grinding of food debris. This waste disposal unit is driven by a ½ HP motor. The motor itself is made from durable stainless steel, which makes it resistant to corrosion producing a longer lifespan. Its stainless steel outer frame is streamlined and reinforces the durability of the unit. One popular feature that makes the Whirlpool GC2000XE Continues Feed Garbage Disposal in a class of its own is Whirlpool’s overload protector with manual reset. 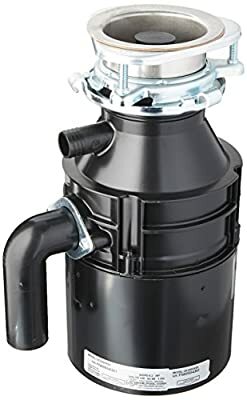 This integrated feature protects the Continues Feed Garbage Disposal by ensuring that it does not become overloaded and in return grinding stubborn food debris more effectively. Thus significantly minimize the chance that your home’s drain pipes will develop a clog. All of this is backed by an extended manufacturer’s warranty. Streamlined Stainless Steel Components –Included is a stainless steel flange and a one-piece plastic stopper. Both the shredder ring and grinding wheel is made of galvanized stainless steel. As mentioned above stainless steel is resistant to corrosion so you’ll be pleased to know that your disposal will have a longer working lifespan. 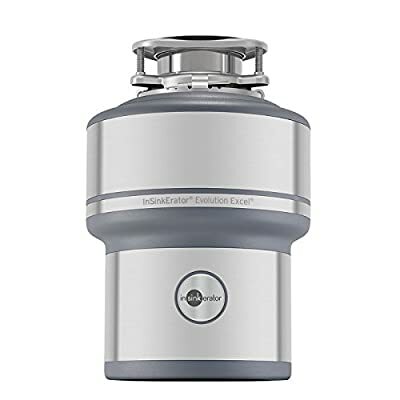 Overload Protector With Hard Reset – This feature is exclusive to all Whirlpool garbage disposals and reduces the chances your disposal will overload due to clogging pipes, it will also extend the longevity of the unit. A Powerful ½ HP Motor – Best solution for a household of 4 – 6 people, the Whirlpool GC2000XE offers more than enough grinding power to dispose of those waste food. From chicken bones to hard vegetables, this motor with stainless steel blades can grind it all. And with a grinding speed of 1800 pm don’t expect to see large bones flushed down the drain pipes. Modern day kitchens need a garbage disposal to help get rid of food debris in the most efficient and best possible way. While a low clearance garbage disposal is your best bet for tight spaces under your kitchen sink most garbage disposals don’t have the ability to grind up tough food to the finest particles. The American Standard Garbage Disposal is one of those waste disposal units that can get rid of most things you throw at it. 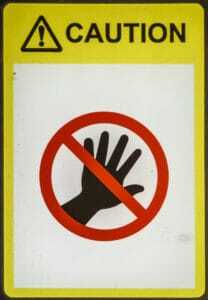 Magnetic Safe ring: The magnetic ring is to safeguard the possibility of any damage that might occur to the unit. This piece of equipment is suited for anyone who is cleaning utensils in the sink. This strong magnet attracts utensils from falling in the garbage disposal which could lead to costly maintenance. Well balanced Turntable: The balanced turntable provides a smooth vibration free operation. With this feature, you don’t need to disturb the person in the next room taking his/her midday nap while you are busy cutting through hardening food debris. In conjunction with the balanced turntable, the inside chamber is insulated to further reduce unnecessary sound levels. Stainless Components: The stainless components within the unit help prevent this Low Clearance Garbage Disposal from developing corrosion. This will also benefit the finer cut pieces to flow easier through the sewer pipes. In addition, helping containing blockage which could easily lead to expensive maintenance costs. The longevity of the disposal will be extended with the built-in stainless steel components. Are you looking for the garbage disposal that won’t let you break the bank, fits perfect underneath the kitchen sink and perform just as good as a high ticket garbage disposal? Then the Goplus 1.0 Food Waste Disposer is a highly recommended shallow garbage disposal for modern day families. This brand new food garbage disposal is an essential part of any modern day kitchen appliance. The 1.0 HP motor delivers a quiet but extremely powerful performance for effective grinding. The motor rotates at 2600 RPM pulverizing waste food into small pieces less than 0.079 inches to pass through the plumbing system. The Goplus Food Waste Disposer is made from high-quality ABS engineering plastics and relies on a low noise motor whose noise value is below 50 decibels. 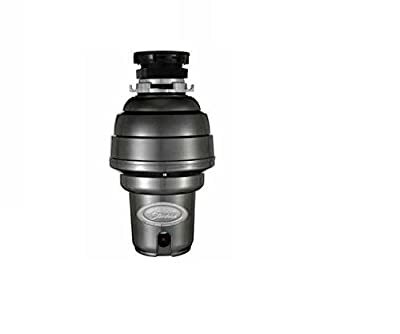 This swallow garbage disposal is a great way to keep the foul odor of waste out of your garbage cans and kitchen. The motor has an ultra-quiet design, with a noise level of below 50 decibels. The only drawback of this unit is you will need a Garbage Disposal air switch to connect to the unit for operation, but overall the Goplus is a reliable unit that won’t break the bank. If you are replacing an existing garbage disposal, your installation effort will probably be easier if you replace with the same or similar model/brand. Although this may not be ideal if you are looking for a different price/feature combination in your new model. In this case, you can search online to determine compatibility and whether or not you can expect complications while installing. You’ll need some Teflon Tape or Joint Compound to join the pipes together: Hopefully, you won’t need to make any plumbing adjustments, but you will still need to put your plumbing pipes back together without any leaks. The most effective way to ensure that there are no leaks at the joint of the pipes is to have a tube of joint compound or Teflon tape on hand. Wrap the Teflon Tape around the threads of the pipes or use a small portion of the compound to smear over the threads before you screw the PVC Pipes back together. Buy a model that is appropriate for your household needs. The idea is to minimize the number of installs you will need over time (this works into the long-term cost equation). Professional Plumbers are expensive, and many of them charge by the hour. The material with which your garbage disposal unit is made of needs to be robust enough to withstand a great deal of use. You will be using your garbage disposer quite often, so it is necessary to find one that can take that level of heavy use. InSink waste disposal units are known for being extremely durable. The blades are made of the highest quality metal and no matter how often you use them to dispose of your waste, there will be no unnecessary blunting of the blades and you are most likely not going to face problems such as the blades getting stuck. Sharp blades are necessary for the overall efficacy of your food waste disposer. One made by InSink can take pretty much any kind of food waste, whether the waste you are speaking of contains hard materials or not. A garbage disposer made by other companies tends to be unable to deal with waste that is not soft. If the slightest hard material enters the unit, you will find that it would either stop working entirely or at best, you would have to deal with clumped-up garbage that you would have to clean out in order for the machine to start working at full speed again. On the other hand, Waste King Units are known for cutting up and compacting all types of garbage quickly and efficiently, so you just have to pop the waste in and you will be good to go. Speed is of the utmost importance when you are dealing with waste disposal units. It just won’t do to have a waste disposal unit that takes an enormous amount of time to handle even the smallest piece of garbage. After all, the whole reason you are getting these waste disposal units in the first place is that you want to shorten the amount of time it takes to get rid of waste, particularly food waste. You want to be able to relax while the machine handles this for you. With an InSink’s Best Garbage Disposal Units, this will all be possible because these machines handle your waste with a great deal of efficiency and speed, leaving you to deal with other tasks while the machine handles your waste for you. Convenience is something that a lot of garbage disposers fail to provide. With InSink garbage disposers, one of the biggest benefits that you get is that you are able to dispose of your garbage and clean the machine at the end of the week. Most other machines would require more regular cleanups, especially if you use them often or if you tend to use materials that are hard and difficult for these machines to break down. Weekly cleanings allow you to focus on other tasks while your waste is disposed of and fix a certain day of the week to clean your machine, which is the most convenient situation for you to enjoy. This is related in a lot of ways to durability. While using an InSink machine, you can rest assured that longevity is not going to be an issue. These machines are built to last after all. They are built to provide you with a long-term solution for all of your waste disposal needs. You are not going to have to worry about replacing your machine every so often, and neither are you going to have to worry about getting your garbage disposer repaired time and time again. These are things that tend to have a negative impact on your overall experience as you would end up wasting a great deal of money on them. This is why it is so important to use the right kind of waste disposal unit that would not require you to put any excessive effort into using it. Even if one of your InSink garbage disposer breaks down, an unlikely event by any means, you will be able to get it fixed thanks to the warranty that these machines come with. This can help you get a great deal of peace of mind as you would not have to worry about maintenance and the like while using your garbage disposer. There is no need to go for the extremely high-end waste disposal units out there. A garbage disposal unit can be affordable as well, and InSink offers a number of affordable varieties for you to enjoy. In fact, InSink is a lot more affordable than other brands tend to be simply because of the fact that the company knows that an enormous profit margin is not the way to go. It knows that providing a high-quality product that customers can both afford and trust is the right way to secure a sizeable customer base that would remain faithful and consistently choose its products and services over the products and services of others. This is why you can choose any InSink Garbage Disposer and rest assured that you are going to get quality, even if you go for the more affordable option. Even with the most high-end option available, you would be saving money when you compare it to other brands and getting a lot more value in return for your money. One of the biggest things that can make it difficult for you to use your garbage disposer in peace is the fact that it tends to be so noisy. This can make it difficult for you to concentrate on work or whatever it is that you are doing, especially if you have just added a sizeable load to the waste disposal unit. This noise is actually not a problem at all with the InSink food waste disposal units because they have been designed to reduce noise by a large margin. While using these waste disposal units, you would be at ease because you would be hearing less than half of the noise that you would normally hear with such machines. This is one of the biggest benefits of using InSink and Waste King waste disposers, and it is why you should try your best to get one of these as soon as possible. The safety of garbage disposers has been something that a great number of people have been concerned about. The problem with food waste disposers is that they can be dangerous if your finger gets too close to the blades. These machines are designed to lay waste to anything that enters them and they are very effective at grinding up anything that gets past a certain point, but the problem here is that they fail to make any kind of distinction between food and human body parts. This is why so many people have lost fingers and the like while they have been using their waste disposers. It’s not just the fact that there are horror stories that so many people tend to tell. There is also the fact that children are liable to get injured if you are not careful. Without proper supervision, it seems highly likely that a child would end up getting very badly hurt while using a waste disposal unit, and this is why it is so important to ensure that your child does not go anywhere near it. However, even if you are the most vigilant parent in the world, the fear still remains and it is this fear that discourages so many people from getting involved with food disposers. InSink has made it a lot easier for you to rest easy thanks to its new technology, which is all about protecting people from getting injured while they are using their waste disposal units. It essentially involves the presence of a magnetic lid that you can put on top of the waste disposal unit. You can fill the unit up with the food or other waste that you want to have chopped up and disposed of, but you will notice that the machine will not function until you put the magnetic lid on. Once the magnetic lid has been properly adjusted on top, the machine will sense its weight and pressure and start to function. InSink garbage disposers essentially have two requirements in order to function. First, they need to sense an item inside the chamber, as does pretty much any waste disposal unit. Additionally, they need the pressure of the magnetic lid. Hence, even if your child puts their finger inside the garbage disposer, it will not turn on since the magnetic lid won’t be on. This is an absolutely fantastic feature that is sure to make a lot of parents very happy indeed. Thanks to this feature, it is going to be a lot easier for people to use their waste disposal units and rest easy in the knowledge that they will not have to deal with any injuries and neither will their children be put into danger. Now, one of the most pertinent reasons why people tend to avoid garbage disposal units is no longer valid, thereby ensuring that you can use these machines with ease and not have to worry about a thing while you are disposing of your waste. The warranty for your product needs to take into account any problem that might occur that was not your fault to begin with. In order to rest easy with these products, the absolute minimum that you should go for is a five-year warranty. InSink offers a minimum five-year warranty on their Best Garbage Disposal Units and has warranties that can extend for a lifetime. For as long as you use a product that has been made by InSink, you will not have to worry about repairs or maintenance because these will be handled for you by the company that you are buying from. InSink and Waste King can confidently offer such things because it knows that its products have been built to last. These garbage disposers have been specifically manufactured so that nothing goes wrong with them. 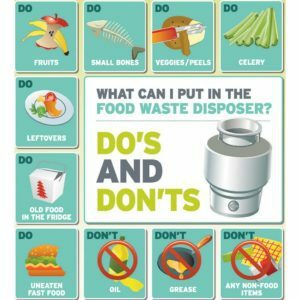 As long as you follow the instructions, it is virtually impossible for these food waste disposal units to break down in any way. In fact, even after long-term use, if the blades get blunt or if you need to replace any part in the machine, InSinkErator, as well as Waste King, will handle these things for you because it knows that after a certain period of time, everything needs a little bit of maintenance. There is a wide range of different food disposal units that you can get from InSink. Even the cheapest model can handle a fair amount of food and can do so very efficiently indeed. 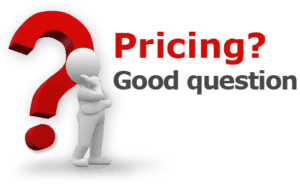 This is why the best option for you is to go for an affordable model manufactured by this company, which would only cost 670 dollars. Alternatively, you can go for the higher-end models. These ones will obviously be the Best Garbage Disposal Units you will get for your money. The most expensive model available costs around $4,500 and this monstrosity can handle anything you throw at it with ease. It will be able to provide you with efficient, noise-free and completely safe waste disposal at the drop of a dime, which is what makes it worth the money that you are going to be spending on it. Hence, you can get yourself a fantastic Waste Disposal Unit with InSink by spending an amount between $700 and $4,500, so you are sure to get something within your budget. If you want to ensure that your waste disposal unit lasts a long time, the main thing you should do is focus on its maintenance. 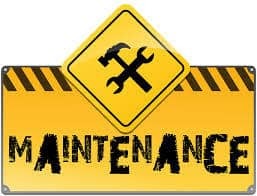 While it is true that InSink provides you with a warranty that you can use to get your garbage disposer fixed, this warranty would be void if you are the one that is responsible for the problem rather than the machine itself. Hence, being safe is better than being sorry as the old adage goes. One of the biggest ways in which you can prevent any damage from occurring to your food waste disposal unit is to avoid putting grease into it. People tend to think that a garbage disposer is where you can throw pretty much anything you want without having to worry about it, which is why they just dump whatever is on their plates into the food disposal unit, thinking that it would be able to handle it. This is not the case, however. If you add grease and oil to your garbage disposers, they will end up getting blocked and clogged, and this would make it difficult for them to function properly. Avoiding grease is essential if you want your garbage disposer to work at its fullest capacity. As far as the blades go, InSink food disposal units are great at handling harder foods, but it is not a good idea for you to add bones and the like to your garbage disposer. While these things might end up getting ground up, they are going to damage the blades of your waste disposal unit and this is not something that you would want. Avoid using such hard items, and your blades will be able to function just fine. Bones can get stuck in the blades as well and end up causing a blockage, which will have to be removed by a professional. InSink is not going to handle this and if the company finds out that you have had a blockage, your warranty might become void and you would not be able to get anything else fixed in the future. However, if your bones are not that big, they are fine and, in fact, might be able to clear up any blockages that might have occurred previously. If you are disposing of food that is fibrous in nature or has a starchy texture such as the shells of an egg or fruit peels, you should try to break it up into smaller pieces before you place it into the garbage disposer. Doing so would prevent the starch from clogging the machine that you are using. These foods are a little risky to use without breaking it apart first because these fibers can get trapped inside the waste disposal unit you are using and moisture can cause them to get larger in size, which can cause some serious blockages. Another common mistake that people make is that they stuff the garbage disposer to the brim, packing all of the food into it and thinking that this is a more efficient way to use it. This is not the case at all because if the food has been packed into the machine too densely, it would become useless and the blades would not be able to move properly. A better way to use this machine would be to loosely place the food into the machine, thereby allowing it to properly cut through it without any difficulty. Cleaning out your garbage disposer is essential for it to function continually without any serious difficulties. This is because food that is left in the garbage disposer might end up getting stuck and if it starts to rot, the bacteria can cause further blockages. Try to give your food waste disposal unit a quick rinse at the end of each day, and clean it out properly once a week. This would help improve the longevity of the product, thereby allowing you to use it for the long run. These are the differences between the waste disposal units available on the market. There are a number of different sized motors that you can get. What motor you get depends on the sort of functionality you want. If you want something that is very heavy duty, it would be a good idea to get a waste disposal unit that has as large of a motor as possible. Additionally, if you want to save a little bit of money, you can just go for a smaller motor if you do not need an extremely heavy-duty machine. There are a number of different kinds of blades available with these kinds of waste disposal units. Getting smaller blades can allow you to get a finer disposal that would be easier on your pipes. These blades are also often sharper than larger variants. Larger blades, on the other hand, can provide you with the option of breaking down larger pieces of waste, which you are going to appreciate if you do not want to take the trouble to cut the waste up before you end up disposing of it. A lot of garbage disposers can get rid of your waste directly into your pipes and as a result, you will not have to take out the trash as much as you would have to otherwise. At the same time, these disposers need you to be a little smarter about the waste you place into them, so you should go for the garbage bag variety if you do not want to put extra effort in before you dispose of your food waste. Getting a large chamber would allow you to dispose of a lot of waste at the same time. Smaller chambers are cheaper, though, so you need to see what you need more. Your choice between convenience and budget will dictate what kind of chamber will be suitable for you. Are you in the market for a new garbage disposal? Chances are if you’ve ever washed dishes you have dropped food down the drain. As anyone who has done this enough times can attest to, it can lead to a clogged drain, and even having to spend all your Christmas funds on a plumber. 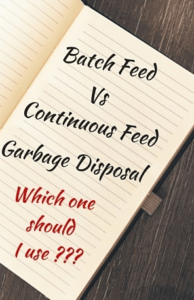 Luckily for you, we are going to give you a rundown on the two major garbage disposals, batch feed, and continuous feed. We hope to tell you enough so that you can make the right decision when the right time to buy arrives! A continuous feed garbage disposal is similar to what the name implies, it continuously disposes of the waste in your sink and drains as long as the switch is turned on. Not everyone drops a lot of waste down their drains, but if you like to cook a lot it is unavoidable. If that’s the case, the continuous feed garbage disposal may be what you’re looking for. This will allow you to be more liberal in how much you dump down your drain. Continuous feed garbage disposals are typically less expensive than a batch feed ones, so this is certainly a consideration to be made when choosing between the lot. With all good comes some bad, however. Nothing is perfect, and while a continuous feed garbage disposal is certainly great to have, it does come with some downsides. There are the potential safety risks, as someone who has used a continuous feed garbage disposal; this is easily avoidable with common sense and a careful hand. It is also recommended to run cold water while using the continuous feed, which just doesn’t make sense when washing dishes, so you may need to wash the dishes completely before turning the switch on. Last but not least, we have the batch feed garbage disposal. Much like the name implies (Noticing a pattern? ), this disposal method will grind up all your sink waste in batches. It will not run continuously like a continuous feed. These are better for people who have smaller amounts of waste (Sometimes you don’t want to cook, or that frozen pizza is calling your name). One of the bigger cons are that you might find yourself leaving the food to collect until you do your batch feed, and this can be a health hazard as food will rot. Other than that there aren’t many flaws that the batch feed system has. As with everything else, it’s up to you to make the final decision. Is one better than the other? No, not really. It’s all about what you as a consumer are willing to pay, how much waste you think you’ll be putting down your drain, and which one sounds like it fits your needs the most. When you are ready to get your garbage disposal, you will be able to make an informed decision. Whether you get the batch feed one, or the continuous feed one, you can and will save a lot of money in potential plumber costs. As someone who used both of these, I cannot imagine living without one. There is so much to consider when it comes to buying the Best Garbage Disposal Unit of any make or model. It’s in your best interest to choose the best garbage disposal unit for your needs according to efficiency, kitchen sink layout and budget. If you have made it this far, you are likely ready to make a decision.